A couple weeks ago, the local food bloggers were invited to a dinner at NaraDeva Thai Restaurant in order to sample many of their delicious foods. I'm honestly not an expert on Thai food by any means, and I've actually been disappointed lately with many of the other local Thai restaurants that I've tried. Because of this, I happily accepted the offer to try NaraDeva in order to find better Thai food. They are located near the Mall of Millenia in the SuperTarget shopping center, in a space once occupied by Bear Rock Cafe. Once I arrived at the restaurant, I quickly spotted the group of food bloggers congregating on the restaurant's patio for drinks. I tried the coconut water and Thai iced tea. The iced tea was my personal favorite of the two. Once we were inside and seated, the feast began as plate after plate of food started arriving at the table. Appetizers came first with chicken curry puffs and chicken satay. The chicken curry puffs reminded me somewhat of Indian samosas, filled with potato and chicken. The chicken satay was served on skewers with a peanut dipping sauce. The next plate of appetizers included shrimp rolls and steamed pork dumplings. The shrimp rolls were interesting, consisting of a whole shrimp wrapped in pork and a spring roll wrapper. After the initial two plates of appetizers, various types of salads started arriving at the table. One of my favorites was the crunchy shrimp salad. This mixed green salad was topped with several large fried shrimp, drizzled in a creamy dressing. Another highlight was the laab. Ground spicy pork was mixed with roasted rice, onions, shallots, dried chili and mint leaves. I had never heard of laab previously, but it was surprisingly good for something as simple as a ground meat mixed with a few other ingredients. The spicy beef salad was topped with thinly sliced pieces of grilled steak with cucumber, tomatoes, scallions, and cilantro in a spicy & sour dressing. Another one of my favorites was the spicy crispy duck salad. This was similar to the beef salad, only with delicious duck rather than steak. The duck was nice and tender and had a wonderful crispy outer crust. The spice wasn't that apparent at first, but the spicyness eventually culminated after a few bites. On to the main courses, the pork fried rice was different from the typical Chinese restaurant fried rice (I'm not always a fan of Chinese fried rice). This was somewhat sweeter and had a whole lot more flavors involved. Way better than I was expecting! I definitely wasn't expecting the beef jerky. The first thing that comes to mind when I hear beef jerky is gas station snack food that I tend to avoid. This beef jerky shared little resemblance to a a Slim Jim. The beef was crispy but was still moist. It was served alongside rice soaked in pandan sauce which was completely new to me. Bright green rice is very cool! The prawns in tamarind sauce were served over a bed of vegetables. I love the garnishes on almost every plate. A pile of shaved carrots topped with an orchid makes always makes food more interesting! It was a while since I had soft shell crabs, so I was happy when these were delivered to the table. The deep-fried whole snapper was very impressive. It's not very often that I get to eat from a whole fish. Figuring out how to best break into the fish to get to the meat was a little intimidating at first, but was a minor difficulty. The crispy skin of the fish was very flavorful while the inside was moist and flaky. Just when I thought the feast would stop, desserts started coming out of the kitchen! The black sticky rice with coconut and palm sugar caramel was interesting. I've had black rice a few times before, but never as a dessert. The coconut cream sauce topping was very nice. The sticky rice with pumpkin custard was also fun. 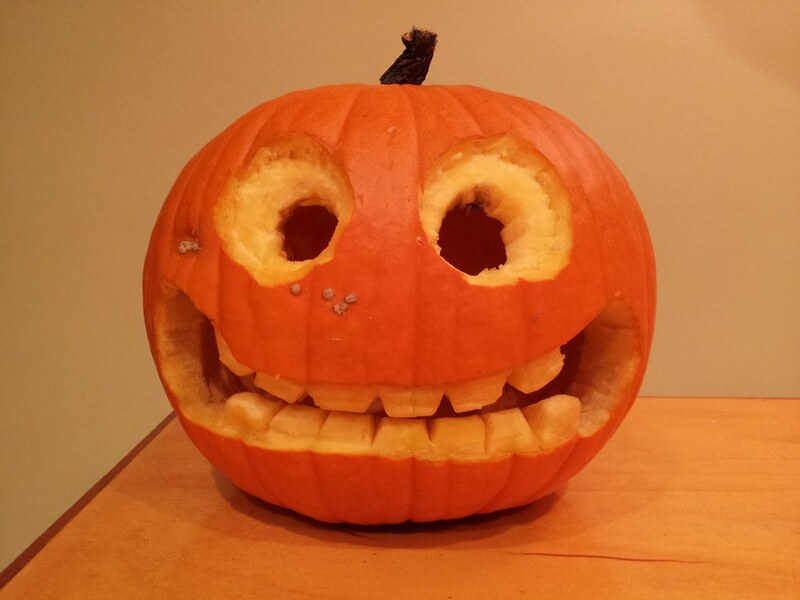 I never really thought of pumpkin as an Asian vegetable with it's association with Halloween/Thanksgiving, but why not? Pumpkin is good on everything! The sticky rice with red beans was served wrapped in banana leaves. This was my favorite dessert of the night. Not only is unwrapping food from steamed banana leaves a whole lot of fun, it also smelled great, sort of like black tea. The rice/beans were very moist, not too sweet, but the coconut cream dipping sauce made it a dessert. The Thai coconut custard was served in tiny ceramic cups and sort of reminded me of a coconut flavored flan. And finally, there was the Thai doughnuts with pandan coconut custard dip. The doughnuts by themselves weren't very sweet, but they were definitely made into a dessert with the green pandan sauce. The event was organized by NaraDeva Thai in conjunction with Traveler Foodie, and I really appreciate being invited. I was definitely not expecting the feast that I was treated to, with all of the food being some of the best Thai I've had lately in the Central Florida area. I'll definitely be back! My meal started out with a salad with the house dressing. This was pretty much what I would have expected from an old-fashioned steakhouse salad. It was nothing exceptional, but it got the job done with iceberg lettuce, onions, tomato, pepper slices, carrot sticks, and croutons. Even though the Cattle Ranch was a steakhouse, I didn't order any beef. Instead, I went with the coconut shrimp. These large shrimp were butterflied and fried in a coconut batter, then served with a baked potato and apple sauce. I've had coconut shrimp in the past where the coconut flavor was completely absent, but in this case, each shrimp was bursting with coconut! I would gladly get these again. I had dinner at a restaurant called Pierogi Grill in Clearwater. As we entered the Polish restaurant, we passed the pierogi themed vehicles in the parking lot. This included a pierogi police car and a giant concrete pierogi on a trailer. I liked this place already. Inside, it seemed like either the owners of Pierogi Grill are really into Egyptology or the restaurant was Middle Eastern themed in a former life. There were statues of Egyptian gods. The lamps over the tables were covered in hieroglyphics, and even the salt/pepper shakers on the table were shaped like pyramids. Surrounded by everything Egyptian, I ordered my Polish Sausage & Pierogi dinner. The smoked kielbasa was served on a bed of warm sauerkraut, alongside six pierogi. There was a lot to choose from in terms of pierogi flavors, but I decided to stay classic and get mine filled with farmers cheese and potato. Overall, everything was very tasty. JR's Softie is an ice cream truck that has been serving soft serve ice cream around Orlando for a while now. I actually attempted to get ice cream from JR's a couple of times in Lake Eola, but they always drove away as I was approaching the truck. Recently, I was at the Maitland Art Festival at Lake Lily and saw that JR's Softie was parked there. I decided I could go for some dessert and approached. This time, they didn't drive away! I wanted a soft serve cone dipped in the hard chocolate but they didn't have any of the chocolate dip. Instead, I settled on a plain vanilla cone. It tasted like soft serve from an ice cream truck should. The prices at JR's were higher that the Mister Softee truck that is normally found in Lake Lily and it's a shame that they didn't have the chocolate dip, but regardless, I enjoyed my dessert. Brewzzi is a restaurant in Boca Raton that seems liked it has ambitions and potential to become a big chain. Right now they only have two restaurants in that area of South Florida, but the menu and look of the restaurant reminded me of a chain for some reason. I recently tried Efes Turkish Restaurant in Sanford. Efes is hidden away in the Sanford Marina in the building that formerly housed Limoncello's. The location, with it's outdoor seating and unobstructed view of Lake Monroe is wonderful. The food is also a vast improvement over what Limoncello's degraded to. Our meal at Efes started with an order of Lahmacun, also known as Turkish pizza. This consists of bread covered in a puree of meat and vegetables, served alongside assorted vegetables. The vegetables were piled on the slices, lemon was squeezed, and the pieces were rolled up and eaten. It was my first time trying this, and I definitely liked it. The mixed grill was also ordered. This dish came piled with lamb, beef, and chicken cooked in various ways over rice and vegetables. While I thought a couple of pieces of meat were a bit bland or overly chewy, the majority of the meal was really tasty. The rice was also surprisingly flavorful compared to most rices. This was meant to serve two people, but between this and the lahmacun, three of us couldn't finish everything. I was enjoying a recent Sunday afternoon at Lake Eola when I decided to stop at The Orlando Farmers Market for some lunch. This farmers market seems to serve more ready made food compared to most and some of the options are kind of exotic compared to the typical farmers market fare. 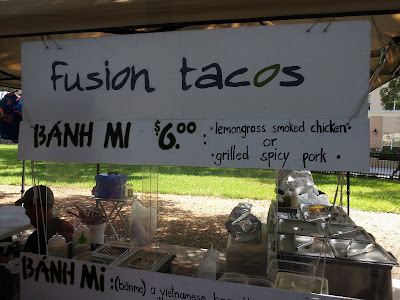 Case in point, I decided to try a banh mi from a booth called Fusion Tacos. The banh mi was filled with spicy grilled pork, cucumbers, pickled vegetables, cilantro, jalapenos, and sriracha. Although expensive, about double the price of what can be bought a few blocks away in Mills-50, the sandwich was still good. The pork was nice and moist with good flavor. They were really generous with all the toppings, and I enjoyed my lunch overall!